Attracted by the Rio Grande Valley's warm climate, friendly people and low cost-of-living, retirees from the north —dubbed "Winter Texans"—have been travelling to the Rio Grande Valley to spend their winters for more than 40 years. Since 1987, The Valley Markets and Tourism Research Center http://www.utpa.edu/coba/tourism/ in the College of Business Administration at The University of Texas-Pan American has been studying their activities, interests and impact on the region. The center's most recent biennial study published this fall —the Winter Texan 2009-2010 Study—indicates an estimated 144,000 Winter Texans or 75,000 households were in the Valley during the 2009-2010 season and their spending resulted in a $802.5 million direct impact on the Valley economy. Dr. Penny Simpson, UTPA professor of marketing, associate dean of the College of Business Administration and the center's director, said this year's study included 1,138 Winter Texans and 84 RV and mobile home park respondents to a questionnaire distributed early this year in the Winter Texan Times, a local print publication targeted to the winter visitors. "Their spending on the U.S. side on routine, monthly purchases and on major, one-time purchases represented an average expenditure in the Valley of $10,700 per household," Simpson said. 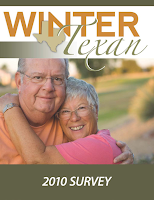 The study of Winter Texans 65 years of age and older also showed on average that they are more educated and have a higher household income level than their counterparts in the overall U.S. population. The research results are summarized in four sections. In addition to economic impact on both the U.S. and border towns of Mexico, the study includes demographic and stay characteristics. Results from the 2006 and 2008 studies for each of the variables are also incorporated into the report to better understand changes in the Winter Texan market over the past five-year period. This year's study also included the results to questions regarding Winter Texans' health and use of health care services. UTPA's Valley Markets and Tourism Research Center is part of the University's outreach efforts designed to provide research and professional service to the region and state. Its research is particularly targeted to examining, understanding and disseminating information about indigenous and transient markets in the Rio Grande Valley to facilitate regional community planning and development. In addition, the center provides educational opportunities for the University’s students by actively involving them in their research activities. Research findings from the center's studies have been quoted in numerous national and statewide newspapers and magazines. Simpson, who leads the center's activities, came to UTPA in 2003 with 12 years experience in higher education as a faculty member. Results of her research has appeared in numerous marketing publications including the Journal of Marketing, the Journal of the Academy of Marketing Science and the Journal of Business Research. She is also an author of the marketing textbook "Marketing Principles & Best Practices." Assisting Simpson in preparing the report were Dr. Suad Ghaddar, associate director, South Texas Border Health Disparities Center, and Dr. Xiaojing Sheng, UTPA assistant professor of marketing. Copies of the complete Winter Texan 2009-2010 Study are available for $100. If you would like to purchase a report or want to obtain additional information, contact Simpson at (956) 665-3311 or e-mail pmsimpson@utpa.edu.